RevMob is a native extension to display ads from RevMov network. RevMob is a worldwide leading ad network when it comes to mobile traffic monetization. The company delivers its publishers with eCPMs well above the average of the industry with a simple SDK implementation. To achieve this they have built a sophisticated campaign targeting algorithm, which maximizes return for both publishers and advertisers. The native extension allows a developer to use all ad types available, such as fullscreen, banner, link and popup. It’s also possible to use events, which are fired for every important change in the ad state, which can be used to check if an ad was loaded or clicked. The extension has a test mode that displays ads but doesn’t count their clicks/installs/etc nor include them in the statistics. 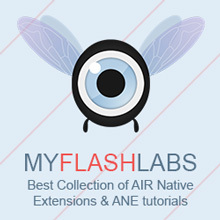 Air Native Extension, Android, iOS Free. URL.